Leftover shredded beef? 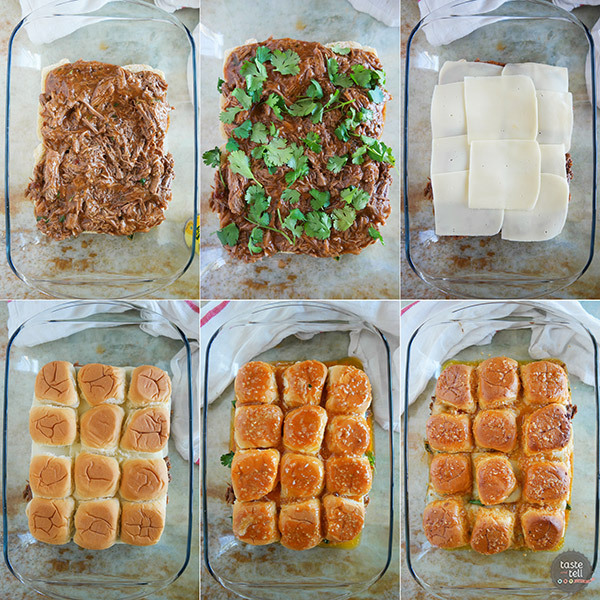 Turn it into these Enchilada Beef Sliders. 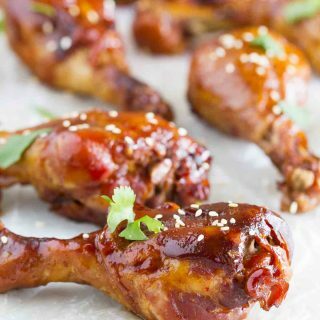 Savory, a little bit sweet and a little bit spicy, they are sure to be a crowd pleaser! Leftovers are my nemesis. I feel like they are a constant battle. I don’t mind them, and I’ll eat them, but it seems like I’m the only one in my family who will even touch them. 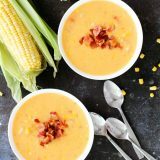 My husband doesn’t normally care to eat the same thing two days in a row (although there are a few things that are an exception to that rule). And the kids? Well, it’s a struggle to get them to eat the first time around, so really, there is no way to get them to eat leftovers. 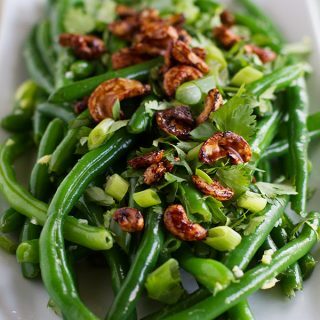 So I am always on the search to find ways to turn leftovers into something new and exciting. 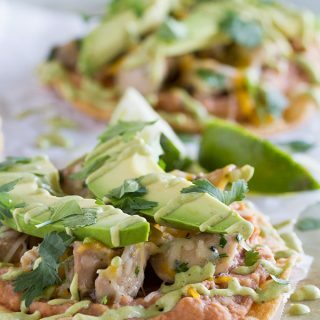 I love shredded chicken, and use it in recipes all the time, so I decided it was time to change things up. Because one can’t live on chicken alone. Today’s leftovers are courtesy of Sunday night’s roast dinner. I don’t think my little family has ever finished off a whole roast, so there are always leftovers. And since I have found my new favorite shredded beef recipe, I needed to find a way to use up some of that leftover shredded beef. 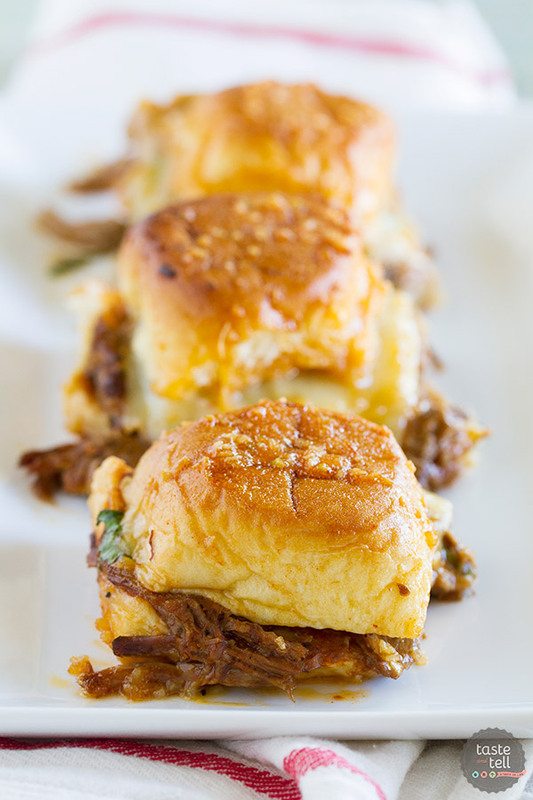 I had ham and cheese sliders on the brain, and that is what spurred the idea for these Enchilada Beef Sliders. 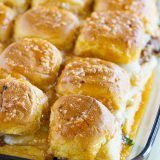 And since I love to give everything a Tex-Mex spin, (and since my beef had Mexican flavors to it, as well), I knew I wanted to give these sliders a Tex-Mex spin as well. These are actually quite simple. 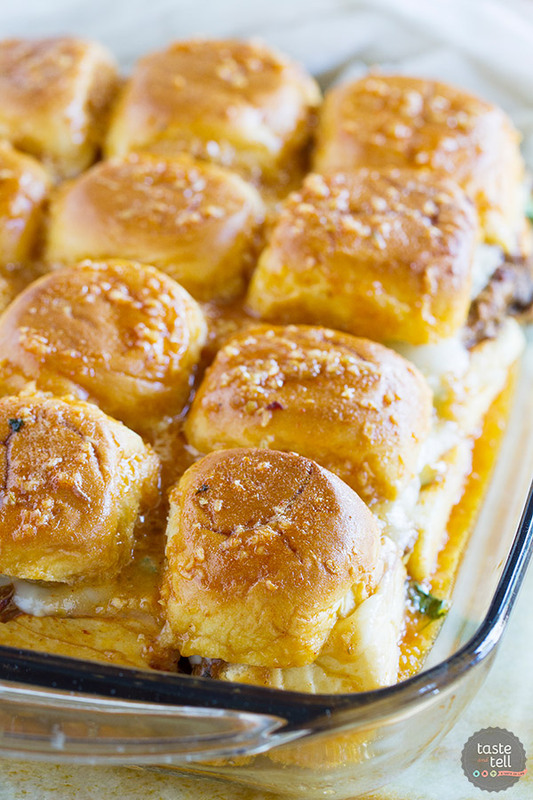 All it takes is a can of my favorite enchilada sauce – Old El Paso Mild Enchilada Sauce – and a few more ingredients to make these sliders that are packed with flavor. 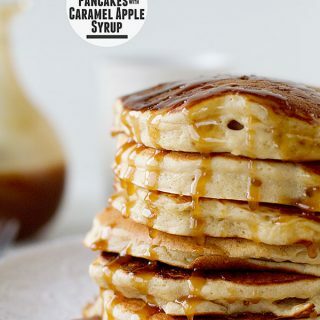 They are a bit messy, and get even messier as they sit, so be prepared for that. But they are so worth it. And no one complains about leftovers when they are turned into a sandwich, right?? 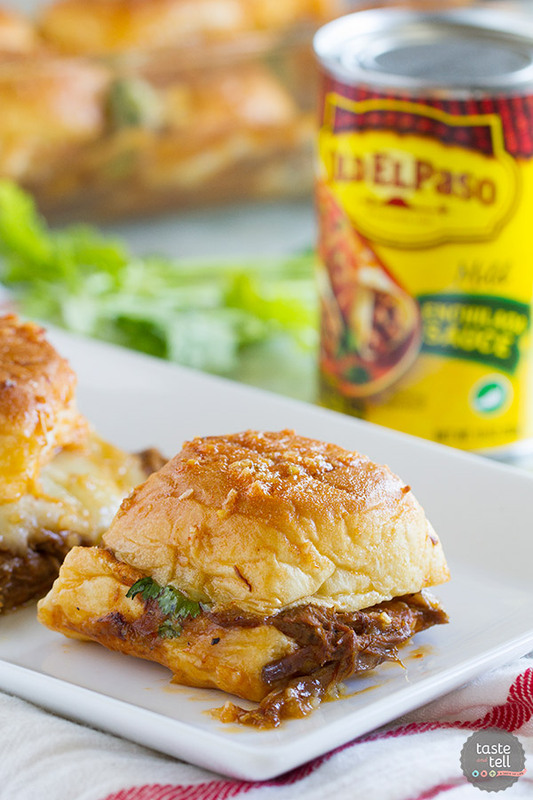 These Enchilada Beef Sliders are a dinner that the whole family will love. 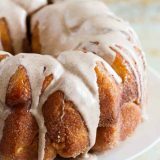 A little bit spicy and a little bit sweet, but totally family friendly. A winning dinner! 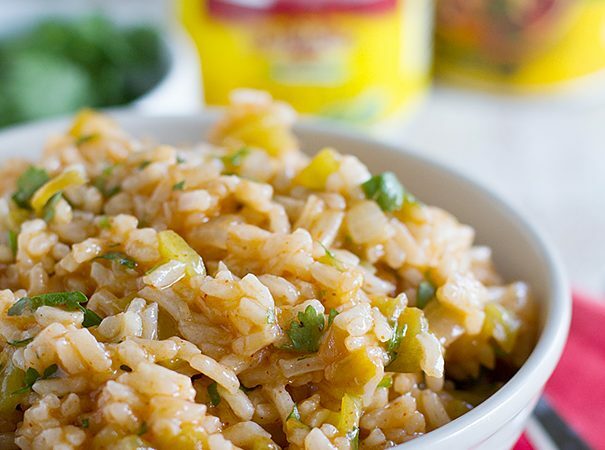 In a small bowl, combine the butter, 4 tablespoons of the enchilada sauce, the brown sugar and the dried onion. Set aside. 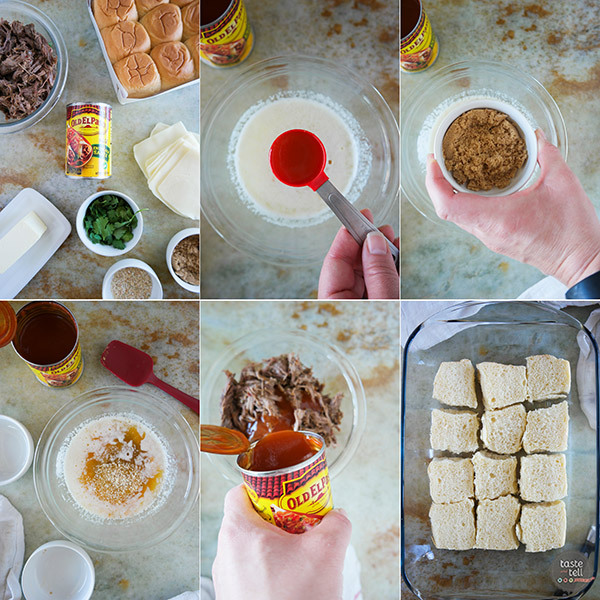 In another bowl, combine the shredded beef with the remaining enchilada sauce. Place the bottoms of the rolls in the prepared baking dish, with all of the rolls touching. Spread the beef over the top of the rolls. Sprinkle the cilantro over the beef, then layer the cheese on top. Add the tops of the buns. Pour the butter evenly over the tops of the buns. Bake, uncovered, in the oven for 25 minutes, or until the tops are toasted and browned. 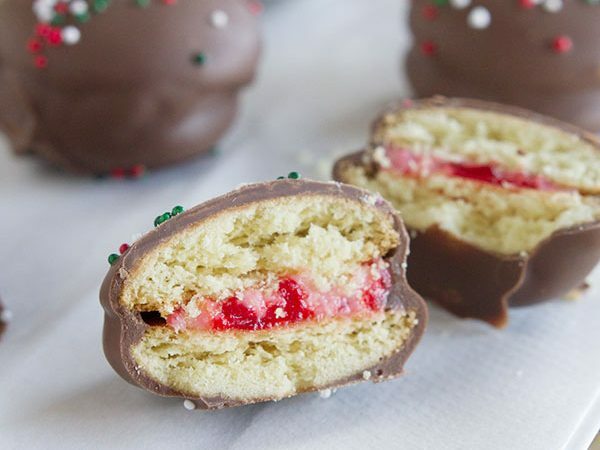 These are best eaten right away, as they will get soggy as they sit. We have leftover roast at least once a month and I never know what to do with it. This is GENIUS! I always have rolls and enchilada sauce on hand. Even the kiddos would eat these! Yesss! These are seriously genius. 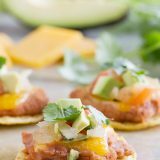 What a perfect and delicious way to do Mexican- love this!